Heat oil in a large pot and fry onion, garlic, cumin and curry powder for 2 minutes. Add the rest of the ingredients and simmer for 10 minutes or until the vegetables are just soft. 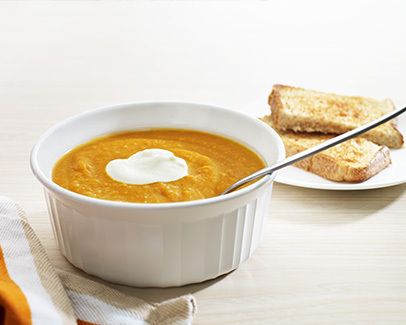 Use a stick blender, normal blender or food processor to blitz the soup till smooth. Add more water if you prefer a runnier soup. Serve with a slice of toast and a spoonful of yoghurt.